BlogHome » News » Simply Safer’s Primary Authority. How to be really confident that your food safety systems are right and have legal protection! When the Environmental Health Officer arrives to inspect your business, how would it feel to know that your food safety system has already been given ‘official approval’ and cannot be challenged? Simply Safer work with the Environmental Health Department at the London Borough Council of Newham (known as a ‘Primary Authority Partnership’). Newham Council’s specialist officers can make a detailed review of the Food Safety System that Simply Safer have proposed for your business and give it official approval (this is called ‘Primary Authority Advice’). They will be saying that it meets the requirements of food law and official guidance. If the Environmental Health Officer tries to take legal action against your business about something that is the subject of Primary Authority Advice, it will be blocked by Newham Council. Of course, you need to actually be doing what is in the Food Safety System to get that protection. Let’s say that you are making your own burgers from minced beef. You would like a separate worktop that is just for raw meat but you do not have the space. So, you follow the carefully devised Simpler Safer procedures that let you safely use the same worktop for raw meat and for ready-to-eat food. As long as you follow the procedure, the Environmental Health Officer cannot disagree with how you are doing it, because Newham Council have approved it. And they cannot reduce your food hygiene rating for that reason either, even if they would prefer you to do it differently. How do I get that protection? Simply Safer can sort that out for you. In the jargon of the Primary Authority scheme, you need to become part of Simply Safer’s Coordinated Primary Authority Partnership with Newham Council. Simply Safer would be your ‘co-ordinator’. Is the protection just for food safety? No, similar protection is also available for Health and Safety and for Trading Standards matters, such as food labelling. Why does this scheme exist? The Primary Authority Scheme was started by the Government in 2009, partly to address inconsistent enforcement that businesses said that they were getting from different Environmental Health Officers across the country. National businesses with many branches noticed this particularly. The Scheme has since been extended to offer greater consistency and confidence to all businesses, regardless of their size. More details about being in a coordinated partnership are here. 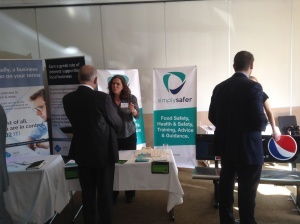 Simply Safer work closely with food businesses large and small, guiding you through complex legislation in a supportive and friendly manner. You choose the level of service that best fits your business. You have access to fully qualified, experienced advisors who can answer all your questions, make sure your documentation is in order and prepare you for inspections.